Healy feels the supporters have to back his players from minute one right through to the last kick of the game. Institute's young defender Dean Curry knows he and Caoimhin Bonner are in for a tough night. “Institute won on Saturday, so it’s all system go, they’ll be coming on a high,” stated Healy. “Promotion and winning last week, so it’s a challenge we should look forward to on our own pitch. “Hopefully there will be a big crowd there on Friday night, spurring us on from minute one to minute 90. “If someone gives the ball away get right behind players. “There was too much said last year, but the players are champing at the bit and the pleasing thing was that we could see the game out at Glenavon. As for ’Stute, defender Dean Curry believes the underdogs tag will suit them just fine this evening. Both sides go into the Windsor Park encounter fresh from opening day wins - over Newry City and Glenavon respectively - and because of that victory over Darren Mullen’s side, the ’Stute centre-back feels their game against the Blues is a ‘free shot’. “Look, it’s a free shot for us now,” he insisted. “We aren’t expected to go up there and get the three points or get anything, but I know all the boys are looking forward to it, especially playing at Windsor. “This is why we want to be in this league, to be playing in the best stadiums and the Brandywell is one of those stadiums. 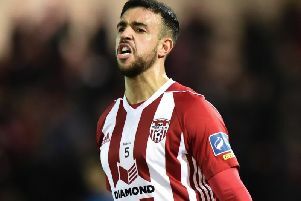 The centre-back, alongside Caoimhin Bonner, played a central part in Saturday’s win at the Brandywell and he knows their partnership will need to be on their toes all season. “It’s good to get our first win on the board and we kept a clean sheet,” he said. “The last time I played in the Premiership, I never kept a clean sheet or a win, so I’m glad to get off to a good start. “We have a good squad, and everyone is able to come in and slot into the team. We have a 22-man squad and we are all fighting for our places, as everyone is itching to get game time. Having played Newry four times last season, Curry knew it was going to be a tough encounter and so it proved to be. “It was always going to be a hard game, especially with us both being newcomers,” he said. “Both sets of players were eager and fighting to impress. Newry played well, but I don’t know, maybe we had a bit more experience or just had that will to win.